So what is a micro-market? Think of a self-checkout, in-office convenience store providing fresh entrees like sandwiches, salads and wraps, heat-to-eat foods, healthy snacks and beverages. It’s open 24/7 and fully monitored by our security team. Best of all, this service can be provided at little to no cost to your business. Sounds great, right? With an extensive micro-market, office coffee, pantry service, and Washington D.C. kiosk vending business, Monumental Markets is the local refreshment service provider with the expertise to get the job done. Micro-markets provide far more options than traditional vending ever could, with service packages that are customized to your specific office needs. 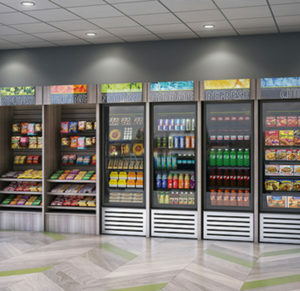 We offer the traditional kiosk vending Washington D.C. offers with snack and beverage options, but we also go above and beyond with options like yogurt, fresh fruit, ready to eat salads, refrigerated snacks and entrees. With a micro-market, you can get your entire lunch (or breakfast) without leaving the office. You and your employees will enjoy the national and local brands you know and love at competitive prices. With a focus on healthy eating, we can provide vegan, vegetarian, gluten free and other choices to suit special dietary requirements. With an unattended market, service is a top priority. Our micro-markets are constantly monitored by our loss prevention team ensuring safety and security. You will have a dedicated Customer Development Manager that analyzes and monitors the selling trends of products and can make adjustments to reflect the taste of your office. Your micro-market will be regularly stocked by one of our friendly delivery drivers who will remove any expiring items and add in new products. And if any service issues arise, one of our highly experienced technicians will address the problem quickly and efficiently. We do things right the first time. That’s the Monumental Markets way! Are you ready to ditch vending and get a micro-market and kiosk vending Washington D.C. respects for your office? Call 301.595.4909 now!